Sen. Bernie Sanders in the studio with Vermont Edition host Jane Lindholm Wednesday. During a live interview on Vermont Edition, host Jane Lindholm raised the effort by foreign bodies, specifically Russia to convince American citizens "to believe something other than what they might otherwise believe." Sanders: Well, ha 'Supporting my campaign?' No," Sanders replied, "they were attacking Hillary Clinton's campaign using my supporters against them."
. @SenSanders on Russian meddling and ties to Trump: "I don't know." "Something very weird" is happening. 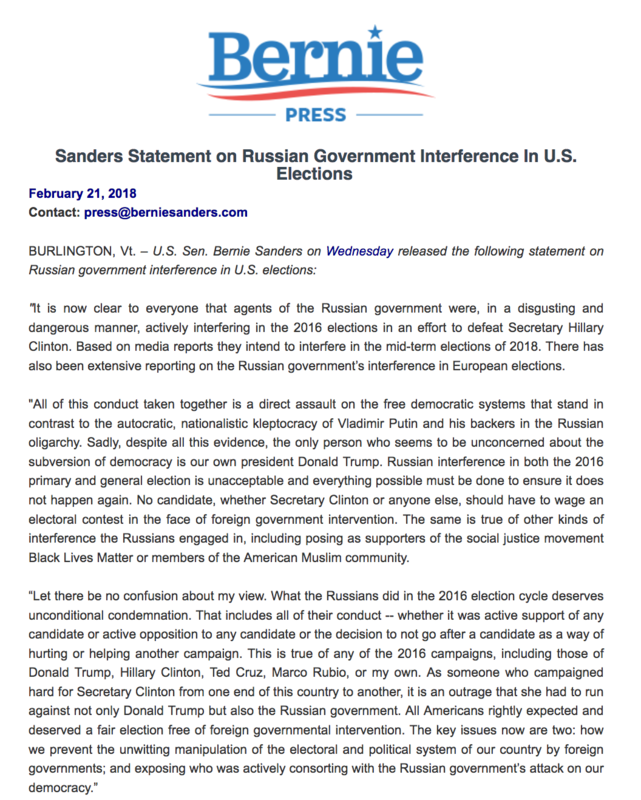 Sanders alluded to being aware something was going on even during the primary campaign, but wasn't clear about exactly when his campaign began to suspect what turned out to be alleged interference by Russians in the 2016 campaign. "In April and May," Sanders said Wednesday, "it appeared that there were lots of strange things happening attacking Hillary Clinton." During the interview, Lindholm asked Sanders why he did not go to his supporters and warn them about the suspicious activity. In response, Sanders said a campaign staffer named John Mattes noticed in late September 2016, hundreds of people popping up on pro-Sanders Facebook pages to disparage then-Democratic nominee, Hillary Clinton. Listen to our full conversation with Sen. Bernie Sanders, here. Around the same time, Sanders was out on the campaign trail campaigning for Clinton. But Sanders stressed that he “did not know Russian bots were promoting my campaign." "I did not know Russian bots were promoting my campaign." "The real question to be asked is" why the Clinton campaign didn't do something. The Russians were trying to promote division among the American people, Sanders said. On Russian meddling: @SenSanders told @JaneLindholm of @vermontedition when asked why didn't he warn his supporters- He didn’t know early on that Russian bots were promoting his campaign. "We knew what we knew, when we knew it,” he concluded. Update 6:19 p.m.: Sanders' campaign released the following statement Wednesday night. The statement released by Sanders' campaign Wednesday night.